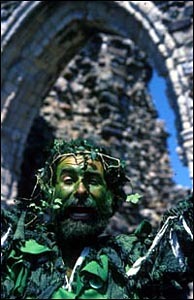 Folk customs with people, usually men, covered in foliage, are found all over the world, but there is a particular tradition in Europe, often a Spring (Beltane) festival, and often including the sacrifice of the foliage covered man. In England the customs appear to be Spring regeneration customs, which may have originated in the Bronze Age, with customs intended to sanctify the coming together of young men and women entering adult life, as suggested by Michael Dames in his books on Avebury. The surviving folk customs centre on the May Queen, representing the life of the new year, the Goddess reborn, and Jack-in-the-Green, a young man covered in a leaf shrouded framework. In the revived Hastings festival, a very lively event, Jack is actually killed in the end, to release the spirit of summer. He is also accompanied during the festival by Black Sal, doubtless a vestigial memory of the Goddess. Her blackened face probably connects her with the chimney sweeps, who took over these May ceremonies in the nineteenth century, and who are still celebrated in the Rochester May festival. A related event is the Castleton Garland Day, on May 29th each year, in which the Garland King wears a flower-covered framework. This is a most attractive event, in longer continuous celebration than many of the others. These May celebrations have obvious connections with nature, with a sense of spirit within nature, and with regeneration.